The Air Jordan Future pays tribute to the symbiotic relationship between the court and the street. This sneaker blends one of the most iconic Jordan designs, the Air Jordan 11, with a one-piece woven upper to create an entirely new look. When the first version of the Jordan Future dropped, the market fell in love with it instantly, so we have been seeing new colors drop frequently for that reason. These are dropping tomorrow along with the “Gym Red” colorway and it’s your choice to take the more reserved “Wolf Grey” option or the louder the “Gym Red”. This edition sports a wolf grey woven upper, gold Jumpman branding, clean white midsole and icy translucent outsole. 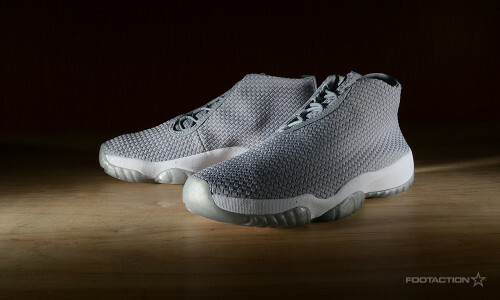 Having a futuristic and minimal iconic design – this Air Jordan Future is expected to be a hot seller for the summer. Print article This entry was posted by hhcblog on July 6, 2014 at 1:23 am, and is filed under Footwear. Follow any responses to this post through RSS 2.0. You can leave a response or trackback from your own site.